The 36th America’s Cup may still be two years away but Emirates Team New Zealand’s campaign is already near top gear and Kiwi industry is winning. Imagine having to raise northwards of $100 million within four years just to run your business, and not being entirely sure how you’re going to do it. It’s not a challenge most Kiwi enterprises face, and yet this is how Emirates Team New Zealand operates day-to-day. The countdown is on for the team, with two years to run until it defends the America’s Cup on the waters of Auckland’s Waitemata Harbour. Chief operating officer Kevin Shoebridge says they are in a good position to do so due to support from cornerstone sponsors such as Emirates, on board since 2004, and its 26-year partnership with Omega. But the drive for sponsorship is ongoing and will continue right up until the last race of the campaign. “We have definitely got gaps, and we’re still looking hard, it’s a very difficult process, far more than people probably think it is,” he says. Some partners may be involved for one America’s Cup challenge and then fall away, some may like one venue and not another, so the requirements change for each cup and replacement sponsorships must be found. The first of the impressive AC75 racing yachts will hit the water in the middle of this year, and from that point onwards Emirates Team New Zealand’s operation will be in top gear, Shoebridge says. The team already has 110 staff and that will top out at around 125 – much larger than when it won the cup in Bermuda in 2017, because as the defender this time around Emirates Team New Zealand has many more responsibilities. Every America’s Cup is different from a budget point of view, and funds are raised specifically for each campaign, Shoebridge says. The team’s constant quest for cash has been the mother of invention. While a lot of the other contenders are funded by private individuals and have instant money available, Emirates Team New Zealand has typically been one of the only commercial teams in the cup and this has bred a culture of innovation, Shoebridge says. “Although you’ve got to have enough money to do the job properly, sometimes having too much ease of funding can be a hindrance, because you can end up with hundreds of projects, people coming up with random ideas that aren’t really scrutinised that closely, and diluting the focus. “We’ve ended up, especially over the last two campaigns, being known as being quite innovative, and a lot of that comes from budget restrictions. Bermuda was a classic case, we were late with funding, we were struggling, we knew that we had to do something different to stay competitive. A key aim of the Auckland regatta is to make it more accessible by sailing close to shore, and that has presented new challenges for the boat designers. Sailing shorter courses with more laps adjacent to the city requires different specifications for things like acceleration and manoeuvrability. As defender Emirates Team New Zealand sets the boat design rules, and it may surprise many to know it has taken the needs of the local marine industry into account in coming up with the impressive AC75 monohulls, Shoebridge says. “It’s a whole new boat, a whole new class. “When we came up with that rule (the AC75s) we were looking for a boat that would have a trickle-down effect to the industry, whether that’s mast design, sail design, boat construction, foils. Something that would have a future and could be used in other areas of the industry. “That was one of the things that spurred us on to move away from the catamarans we used in Bermuda. Although they’re amazing boats they didn’t really have an association with the normal yachtsman. A fixed wing like those boats had, a solid wing that required 30 or 40 people to launch them every day, just wasn’t that practical. “We’re trying to come up with, for example, a semi-soft wing on this new boat that is something that could eventually be seen on cruising boats. “That remains to be seen but we’re hopeful that will happen,” Shoebridge says. As Emirates Team New Zealand builds its operation the inventiveness emanating from the campaign has a flow-on effect to the New Zealand economy. The impact of innovations born out of the America’s Cup has been felt since KZ7 first challenged for the Auld Mug in Perth in 1986 and continues to cascade through local industry, says Peter Busfield, executive director of the New Zealand Marine Industry Association. The lighter and stronger you can build a boat the faster it will go, and so many technological advancements have come from the need to create ever better composite materials. Oracle Team USA, beaten by Emirates Team New Zealand in Bermuda, moved to New Zealand and built its boat at Core Builders Composites in Warkworth to try and nullify the advantage the Kiwis had in terms of local boat building technology, Busfield says. The use of hi-tech composites now stretches as far as outer space, he says. “I doubt very much whether Peter Beck would have been able to build Rocket Lab in New Zealand if it hadn’t been for the America’s Cup, because he is using technology that’s used for making America’s Cup boats. The list of technologies successfully transferred to other parts of New Zealand industry goes on, he says. Avondale-based Southern Spars which built Emirates Team New Zealand’s 2017 winning catamaran has also applied its expertise to creating carbon fibre wheels for racing bikes ridden by New Zealand’s top track cyclists. The umpire boats used in the 2000 America’s Cup inspired the Protector range of power boats, based in Mt Wellington and now exported globally. The Kiwi marine industry’s association with the America’s Cup literally opens doors for business people, says Clint Jones, managing director of anti-foul specialists Oceanmax and a former America’s Cup media boat fleet coordinator. “I started with this business five years ago when I got back from the cup. Back then we had two people, today we have 18. “I can start speaking and people go ‘this guy’s a Kiwi, he’s out of the marine industry, we’d better listen to him’. The local industry is particularly good at producing high-value componentry, he says. 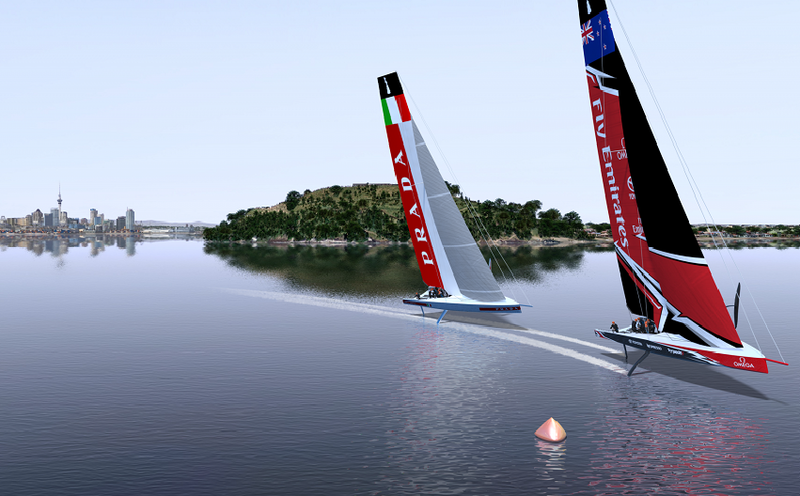 Another example is the virtual boundary system that corrals the fleet of America’s Cup spectator boats, developed by Auckland-based Vesper Marine and now used for a variety of marine safety purposes around the world. “Our products aren’t produced by the million, we make high value, high-quality marine products. “That’s where the New Zealand marine industry has gone and I believe that’s where we need to keep going,” Jones says. Visiting superyachts will also spend anything from $100,000 to $3 million each on maintenance and refurbishments while they’re here. Based on past America’s Cup campaigns the sector is expecting around a hundred additional superyachts to visit these waters for the regatta – that’s on top of the usual 50-55 which visit each season. The following New Zealand summer another wave of vessels will arrive in time for the regatta and likely stay on in the region, providing more work. “So we should see three summers of good times,” Loynes says. There is a worldwide fleet of 6500 luxury yachts and they all need maintaining and refurbishing at some stage, and Oceania Marine is preparing to meet that market. It has received approval for a loan from the government’s Provincial Growth Fund to buy a significantly bigger travel lift which will allow it to service more and a greater variety of vessels, Loynes says. The Spinoff’s business section is enabled by Kiwibank. Kiwibank backs small to medium businesses, social enterprises and Kiwis who innovate to make good things happen.